That sounds pretty simple doesn’t it? I am always working on making my classes interesting and educational for my little children. Usually I am creating activities for my preschool and kindergarten classes. Today, however, I had a different idea. For the next two years my songwriting will be specifically focused on my babies, and as I am focusing on my babies, I am creating more learning ideas in song for them. So today while I was singing my song, The Number Song, for my babies, I suddenly realized that I needed an activity to help my tiniest audience begin to absorb my concept of recognizing numbers. Now with babies I do not believe in forcefully trying to teach them. I always believe in simply having the visuals around so that the babies can slowly absorb concepts through osmosis. I went home and began trying to figure out what I needed. Do I need letters for them to handle? I thought that was too complicated. I need a visual that they all can enjoy. And then it hit me—a rug! I need a rug with the numbers 1 through 10. So I began shopping online. That was not easy. My rug had to be bright and clear. After a few hours I found the perfect rug. It has all of the numbers 1-10 and it even has the ABCs. It is bright and it is perfect. 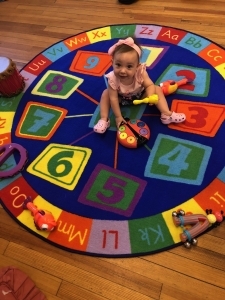 I happily ordered it and am pleased to say that I saw a few of my babies trying to pick of the letters off of the rug. This is a wonderful educational addition to my babies class! I’ve already enjoyed singing my newest song, My Alphabet Soup, because I have this wonderful visual. Now don’t get me wrong. Most of my songs for babies are movement songs and interactive songs to be done with their Grammies, mommies and daddies. But now, I am pleased to say, I can begin adding other learning concepts in song because of the visuals that I will be adding to my babies class.